Angela Smith – Founder of Shark Team One, is a passionate conservationist, researcher, photographer, filmmaker, explorer, educator and ocean advocate. In response to the rapid decline of shark species around the world Angela created Shark Team One, a conservation expedition organization. Shark Team One plays an important role protecting sharks and ocean ecosystems with conservation projects, outreach initiatives and citizen science expeditions to worldwide locations where endangered shark species can still be found. 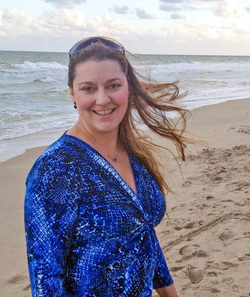 Angela was awarded the “Community Leader – Ocean Environment Award” from National Week of the Ocean for “Creation of a South Florida presence via community events for awareness of dwindling worldwide shark populations" and nominated Blue Ambassador of the Year for “Significant contributions in South Florida marine conservation”. She is also a PERC “Enviropreneur” Fellow, having been invited to attend the “Enviropreneur” Institute in Bozeman, Montana. In 2015 she was inducted into the prestigious Ocean Artists Society (OAS) for conservation photography and photojournalism. Her film and video producer credits include Academy Award winning films and Peabody Award winning educational broadcast programming. As a director, her documentary short films have won awards and been selected at BLUE Ocean Film Festival, Fort Lauderdale International Film Festival, Berlin Flash Film Festival, Wildlife Conservation Film Festival, appeared in Wyland Foundation videos, at the Jackson Hole Science Media Awards and Jackson Hole WILD Living Oceans Film Showcase in partnership with CITES and United Nations Development Program. As a Vice-Chair representing non-governmental organizations for Southeast Florida Coral Reef Initiative (SEFCRI), a National Action Plan by United States Coral Reef Task Force (USCRTF) and a working group member for Florida DEP's program “Our Florida Reefs”, Angela is also developing federal and state management strategies to ensure healthy coral reefs and protected marine ecosystems along the Southeast Florida reef tract. She recently spearheaded the development of the Coastal Southeast Florida Hope Spot with IUCN World Conservation Congress and Sylvia Earle. Angela's underwater photography appears in gallery exhibits, publications and is used by conservation groups worldwide to highlight the need for ocean action. With a background in film and television she has also worked with companies such as CBS, NBC, PBS, Touchstone Pictures, Universal Pictures, Warner Brothers and Discovery. She has held Director and Executive Producer positions at Propaganda Films in Los Angeles and Metropolis Group - London/New York. As a public speaker Angela gives lectures and seminars nationwide speaking about shark conservation, endangered species and ocean ecosystem protection, worldwide expeditions and exploration. Venues include dive clubs, trade shows, museums, libraries and corporate functions. Angela is also a Cressi Ambassador, contributing writer and photographer for the Sylvia Earle Alliance, a photojournalist for Ocean Artists Society, a writer, photographer for National Geographic Open Explorer and a recipient of research support from the S.E.E. (Science, Exploration, Education) Initiative, supported by sponsors such as National Geographic, OpenROV, Gordon and Betty Moore Foundation, Rolex and Avatar Alliance Foundation.